The worldwide mining industry is currently facing a significant restructuring process. In most underground mines, widespread mechanization of the mining processes increases production while reducing staff numbers. At the same time, the mining depths as well as the lateral spread of the mine workings are increasing. This ever changing mining environment is requiring sophisticated solutions for the design and operation of the underground mines. In fact, a reduced number of mining engineers is taking responsibility over ever increasing mine operations. This does not only apply to the excavation of the minerals, but also to all other aspects of the mining operation, including health and safety, disaster management and mine rescue organization. Most mining engineering graduates entering the industry lack experience in mine emergency management. Young engineer trainees must learn mine emergency response and rescue work in addition to their normal training experience on the job. Often, and unfortunately, emergency and rescue training at different mining companies is not carried out to the highest level and standard and with the best possible training outcomes. The tasks and challenges a young engineer faces while being trained in a new position do not leave much room for additional training in mine rescue and emergency management. At the same time, experienced “old hands” are retiring and cannot easily be replaced due to limited graduation numbers. Strategies are being developed at mining universities worldwide to train mining engineering students in handling mine emergency situations and to provide hands-on experience for managing potential accident and disaster scenarios underground. One of these strategies from Germany is presented in this paper. This specific strategy has to be seen under special consideration of the local and regional boundary conditions in Germany, but might serve as case studies for mining schools and universities in other countries. Due to the ongoing restructuring and simultaneous decline of the number of large underground mining operations, the mining industry in central Europe is experiencing a steady decline of personnel in the remaining mines. The fear is that in some regions the well-established, centralized mine rescue organizations may collapse within this decade. With this, a large number of small mines and underground operations may face a lack of skilled and capable mine emergency and rescue support. New strategies and organizational efforts for sustainable mine rescue operations in Germany are currently being discussed. German federal mining law requires companies to provide suitable mine rescue coverage for their underground operations. Mines must either establish their own rescue teams or join and support centralized mine rescue organizations or rescue teams. Based on the size and number of the still active underground mining operations in Germany, five central main mine rescue centers are being maintained nationwide. Two of these centers are operated by the German hard coal mining industry, while the other three centers are run by the BG RCI, the employers’ workman’s compensation insurance association for the minerals and chemical industries. The central mine rescue centers are responsible for the education and certification of mine rescue team members and the ongoing education and training of teams and team leaders. The rescue centers are also equipped with state-of-the-art testing equipment in order to maintain and calibrate mine rescue equipment. The centers also establish guidelines and recommendations for the use of the personal protection and rescue equipment as well as for the execution and coordination of rescue operations and set the standards and write content for mine rescue training courses. The “guidelines for mine rescue” set the fundamental requirements for the German mine rescue. These guidelines are established by the “German committee for the central mine rescue”. In Germany, every active member of a mine rescue team must be at least 18 years old and should not be older than 40. All volunteers, individuals may serve as team members, team captains or a chief. Traditionally, all members must be fully trained, experienced miners who are familiar with a variety of situations underground. All mine rescue team members must have medical clearance under German medical standard G26/3, a specially designed, extensive medical examination under physical stress for people working under breathing apparatus. This clearance must be obtained before a rescue team member may be permitted to wear a breathing apparatus in a mine rescue operation or training. This thorough medical examination must be passed every other year and must also be renewed after recovering from illness or accidents. Content and duration of the training for rescue team members, team captains, chiefs of rescue teams and equipment or bench technicians is prescribed in the guidelines for the central mine rescue stations. These guidelines also govern education and training for mine rescue team members, organization and preparation of rescue operations, the minimum number of rescue teams present on site before a rescue operation can commence and an equipment list required before starting the rescue operation. An apprentice may become a mine rescue team member-in-training after attending a one-week basic training course and passing theoretical and practical examinations. After a year of regular practical and theoretical training, the apprentice will become a full mine rescue team member. In subsequent years and by taking additional courses and examinations, a mine rescuer may also qualify as a troop leader or chief. Due to the ongoing restructuring in the German mining industry, changes in the basic structures of mine rescue operations must be implemented. Generally, a minimum of three fully operational mine rescue teams must be on site to commence a mine rescue operation in a non-coal mine, while ten teams must be present at a hard coal mine. Under the new structure, smaller, three-men-teams may be formed to enter the mine under certain circumstances if the emergency is at a small mine and for life-saving operations only. A second team must stand by. The new and adapted regulations, together with other restructuring elements and modified operating schemes had been presented for public comment during the year 2014 and have recently been implemented. The Department of Mining Engineering of the Technische Universität Bergakademie Freiberg (TU BAF) has been part of this restructuring program for several years and has been hosting a number of scientific conferences and workshops on the reorganization and restructuring of the mine rescue scheme in central Germany. Fig. 1. TU BAF Mining Students at BG RCI Central Mine Rescue Station. // Bild 1. TU BAF-Grubenwehrteam während einer Grubenwehrübung an der BG RCI Hauptstelle. Occupational health and safety is a core competence for mining engineering graduates. This has led to the implementation of related course content into the mining engineering curriculum almost a century ago. Since then, specific short-courses have been covering the subject not only for mining engineering students, but also for all other raw material majors. For several decades, the mining engineering students have been trained in a supplementary course in mine rescue provided by the Central Mine Rescue Station of BG RCI in Leipzig (Figures 1, 2). During this block course, students are introduced to the structure, tasks and responsibilities of mine rescue as well as the organization of a mine rescue operation. The short course usually ends with a “hot” emergency practice under breathing apparatus in the BG RCI exercise and training center, which resembles the confined spaces and obstacles typical of an underground mine. Like every other mine rescue team member, the participating students also must obtain medical clearance before being admitted to this course. Traditionally a mandatory part of the mining engineering education, constraints in engineering education today require that this course be offered on a voluntary basis. Still, a majority of TU BAF students participate in the training. Fig. 2. 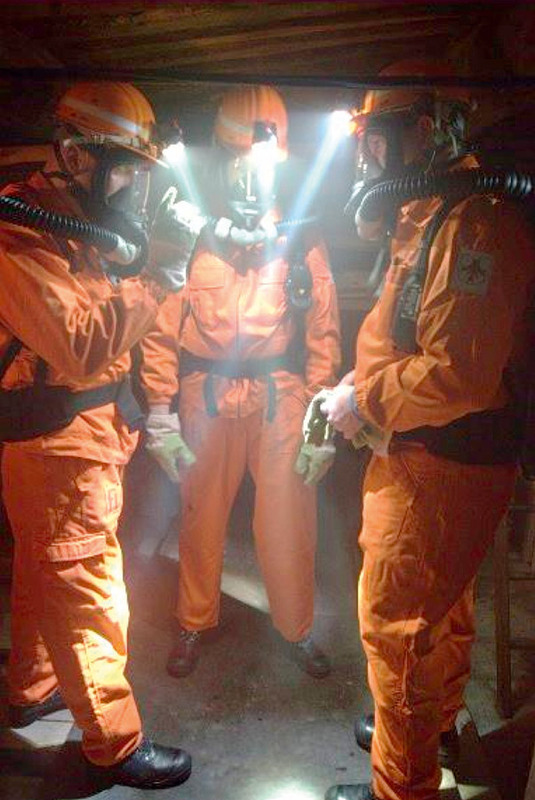 Confined Spaces Training at BG RCI Central Mine Rescue Station. // Bild 2. Kriechstrecke in der BG RCI Hauptstelle. communication and public relations management in simulated cases with serious and fatal injuries. Fig. 3. Incident Command Structure and Set-Up in Germany. // Bild 3. Organisation des Krisenstabs in Deutschland. Figure 3 shows the typical organizational structure and layout of an Incident Command Center (ICC). Students perform several practical exercises where they assume different roles managing an emergency. These role play exercises are adapted from real incidents and include the necessary internal and external communication as well as public relations management including press releases and press conferences. This course is mandatory for all mining engineering majors. servers in the second Intercollegiate Mine Emergency Response Development Exercise (MERD) at the Colorado School of Mines (CSM). Following this exercise and through close interaction and discussions with the American colleagues, a similar student mine rescue team structure has now been implemented at TU BAF, making use of the “FLB Reiche Zeche” research and experimental mine on campus. A member of the CSM student mine rescue team was invited to Germany and worked on an implementation project at TU BAF in 2013. Like some other US mining schools, the Colorado School of Mines (CSM) currently trains three student mine rescue teams: The first CSM team was formed in 2009, joined by the second team in 2010 and the third team in 2011. Membership in the CSM mine rescue program is voluntary and open to students of all majors at CSM. The program is organized and run by students and the teams are made up of engineering students from nearly all major engineering majors at CSM. The students must meet basic physical health requirements in order to ensure the personal health and safety of the team members and of the entire team during program activities. The student team captains design training plans together with the faculty program coordinator. The program’s faculty advisors assist with the logistics of the trainings and helps organize practices, practice sites, equipment, tools and supplies. Experienced mine rescue specialists from the industry are often called in to help with team practices and to teach specific subjects ranging from equipment maintenance to mine ventilation, first aid, communication and map work. Teams are also trained in the operation of an ICC. Training objectives are established at the beginning of each academic year. Practices may include full mine rescue problems, post-disaster exploration exercises in artificial smoke, technical rescue training and specialty assignments. In total, the CSM teams practice more than 2,000 person-hours per year. The overarching goal is that each rescue team and every team member can demonstrate proficiency and understand mine rescue procedures and protocol, regulations and mine rescue regulations. 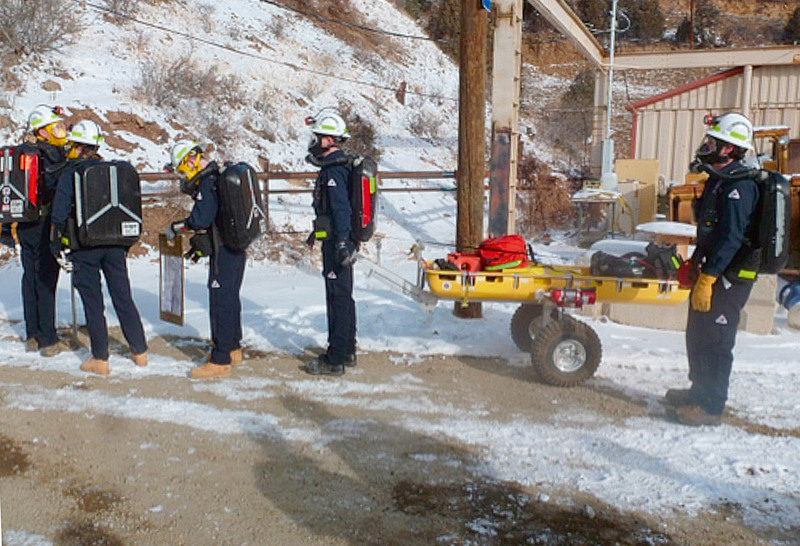 Every other year, the CSM Mine Rescue Program hosts the MERD at the Edgar Mine in Idaho Springs, Colorado (Figure 4). This competition is for student mine rescue teams only. Fig. 4. Student Underground Mine Rescue Exercises at CSM / Edgar Mine. // Bild 4. Studentische Grubenwehrteams auf der Edgar Mine der CSM. Each year, all three CSM mine rescue teams also compete in professional mine rescue contests. These professional contests are great opportunity for the student teams to test their skills against professional mine rescue teams and to expand their network. The contests evaluate the competitors on their knowledge of mine rescue rules and regulations, their ability to work and communicate as a team, technical understanding of their equipment and first aid skills. Based both on the good experience with the established mine rescue courses at BG RCI Leipzig Central Mine Rescue Station and the new, extended programs established at U.S. universities, the Department for Underground Mining Methods, together with the Forschungs- und Lehrbergwerk of the TU Bergakademie Freiberg has developed a new, two-stage theoretical and practical mine rescue training program for students. In the first stage, TU BAF offers a two-semester lecturing module ”Safety and Rescue in the Raw Materials Industry“ with both theoretical and practical elements. In this module, the students will learn about risk sources, hazardous and dangerous situations in the raw materials industry, the typical structures of disaster management and rescue operations in a mining industrial environment. This covers not only disaster prevention strategies but also the structure and organization of mine rescue and explosion protection brigades, immediate and strategic incident management and command structures, and incident staff work. A special focus area is the professional communication with the public and the media. In practical exercises and role-plays, the students will gain competence not only in the ICC operation, organization structure and public relations, but will also be able to judge and understand the role of the media and social networks in a modern, communication-based society. Beside classroom lectures, the students will execute practical exercises in realistic situations, including press-conferences, setting up an ICC under time pressure or coordinating external fire, medical and technical support brigades. In order to allow students from all majors at TU BAF to participate, the BG RCI Safety and Rescue module has become part of the general studies program in 2015. General studies offer a selection of interdisciplinary courses which are offered as electives in most programs at TU BAF, thus allowing the students to collect university credits towards their degree. Due to the costly medical examination required for exercises under breathing apparatus, not all students choose to obtain medical clearance. Still, practical exercises are designed in a way that those students without medical clearance can still participate. 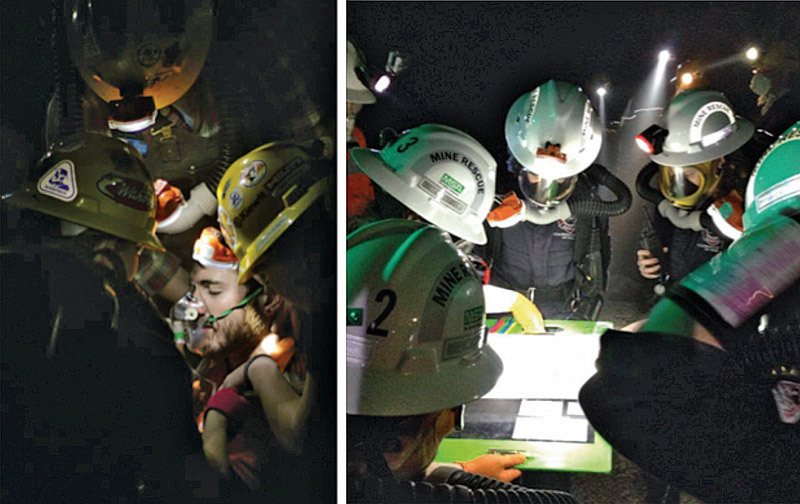 The second stage of the “Student Mine Rescue” program is a more practically focused mine rescue program. While the BG RCI module serves as an in-depth introduction into the mine rescue operations, this second stage is geared towards student mine rescue training in a full-scale underground mine environment. Students exercise like regular mine rescue teams, develop advanced team communication skills and practice realistic mine rescue scenarios in an underground mine. The exercises are held at the “Forschungs- und Lehrbergwerk” (FLB) that is operated by TU BAF. An extensive training space at the FLB is being modified to be used as an underground mine rescue training center not only for mine rescuers, but also for underground and confined space training for fire fighters, the German federal agency for technical relief (THW) and other special rescue teams. The “1/2 3. Sohle” mine level is reserved for the training of support and rescue units. Comprising drift, galleries, raises and old stopes of different cross sections and slopes, this area offers a wide range of real-life-scenarios typical in a hard rock mining environment. Beginning in fall 2016, the two mine rescue courses are being offered as electives within the regular mining engineering curriculum at TU BAF. 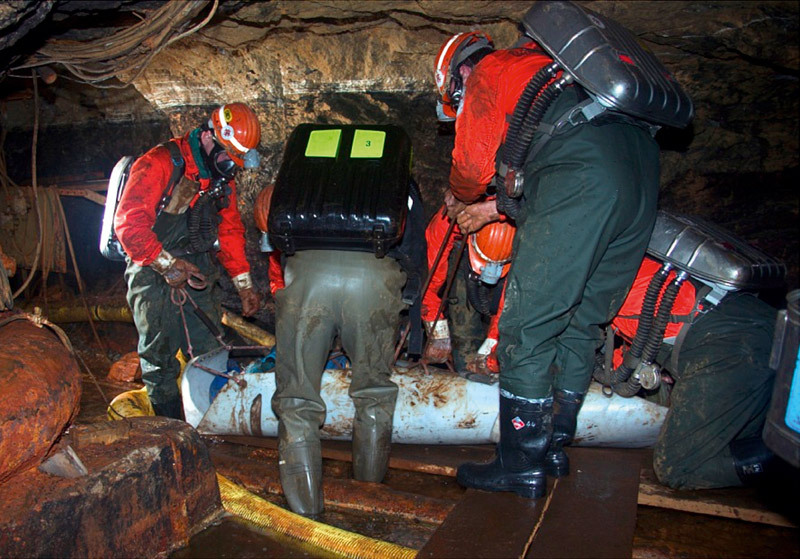 Typical tasks of such underground exercises are the construction of ventilation stoppings or seals and exploration practices to find “injured” miners in a narrow or technically difficult section of the mine. Such situations are quite realistic in regions with more than 1,000 years of mining history and vast, unknown old mine workings. Teams working under breathing apparatus are tasked to find and map a specific object in the mine and to report its exact location to the Fresh Air Base (FAB, in German “Bereitschafts-stelle”), record air quality and damage to ventilation control equipment, roof control hazards and evidence of a fire or explosion. Team members stationed at the FAB record all observations and communicate them to the ICC. Such exercises not only test the team’s ability to move and cooperate in a confined environment, but they are also a great tool to practice communication between the team, the FAB and the ICC. Other types of mine rescue practices may include high- and low-angle technical rope rescue, confined space training and firefighting, both underground and at surface locations. Fig. 5. 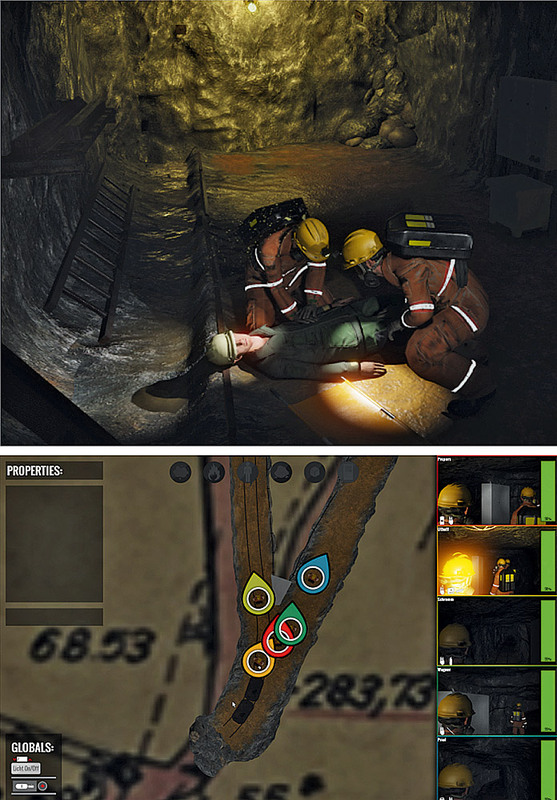 Virtual mine rescue simulation with the Cinector-Engine. // Bild 5. Grubenwehrsimulator in der Cinector-Engine. A new developed virtual mine rescue simulation computer tool (Figure 5) has been developed as a research project “Mining-RoX” (Robots in Saxony) in a cooperation between the TU BAF and the University of Applied Science Mittweida. Its development was funded by the Ministry for Science and Art in the German State of Saxony. It is planned to offer this virtual mine rescue simulator for general mine rescue education and training of professional mine rescue teams. Fig. 6. Student Mine Rescue Teams at MERD 2013. // Bild 6. Studentisches Grubenwehrteam beim MERD 2013. After successfully completing both mine rescue courses, it is planned to allow fully trained Freiberg student mine rescue teams to participate in the international MERD exercise at CSM (Figure 6). These professional contests provide a great opportunity for the Freiberg teams to match their skills against other student mine rescue teams and to expand their professional networks. Student MERDs are a great opportunity for mining engineering students to learn from each other while also getting valuable advice from professional mine safety and rescue specialists. Fig. 7. Mine Rescue Exercise at FLB Reiche Zeche Research and Experimental Mine. // Bild 7. Grubenwehrübung auf dem FLB Reiche Zeche. The Freiberg student mine rescue team will be trained according to the rules and regulations like all other professional mine rescue teams in the central German region and will be outfitted with standardized breathing and technical rescue equipment. The near-term goal is to not only operate this mine rescue team for the training of the students, but also to support the existing mine rescue structure of the FLB experimental mine (Figure 7). Currently, the legal requirements for the integration of a student mine rescue team into the safety and rescue structure of the mine as well as into the overall disaster control structures of the region are being discussed with the mining authorities. The mine rescue block course at the Central Mine Rescue Station in Leipzig is sponsored by the BG RCI and Drägerwerk AG & Co. KGaA, Lübeck/Germany. The incident management course is taught by lecturers from the industry. The on-site mine rescue training is supported by the leadership of the Wismut GmbH mine rescue station, which represents the core of the new Saxonian mine rescue structure. Training is supervised by the chief advisors and the CEO of the Central Mine Rescue Station in Leipzig. For mine rescue education at TU BAF and for the training of the new student mine rescue team, the Drägerwerk AG & Co. KGaA has donated a number of new Dräger PSS® BG4 plus breathing apparatus along with latest generation gas detection devices. 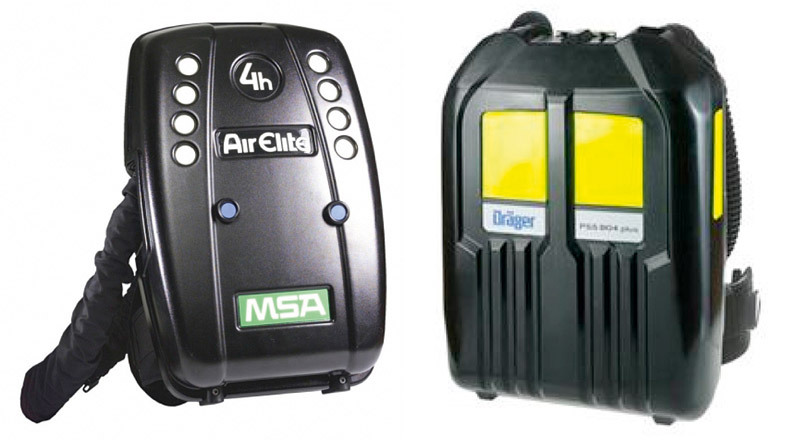 The MSA Auer GmbH, Berlin/Germany, a subsidiary of the MSA group, has also donated several late model gas detection devices and two AirElite 4h breathing apparatus that can be used both as training as well as a “live” rescue apparatus (Figure 8). The AirElite 4h are identical to those used by all other regional mine rescue units in Saxony, thus allowing members of the student mine rescue teams to train alongside with the professional mine rescue teams in the region. Student mine rescue and emergency training is a unique way to emphasize the importance of mine safety and mine emergency management to young engineers. It allows students to enter the industry with a valuable set of skills in recognizing safety and health hazards in mining, while providing an opportunity for professional networking. 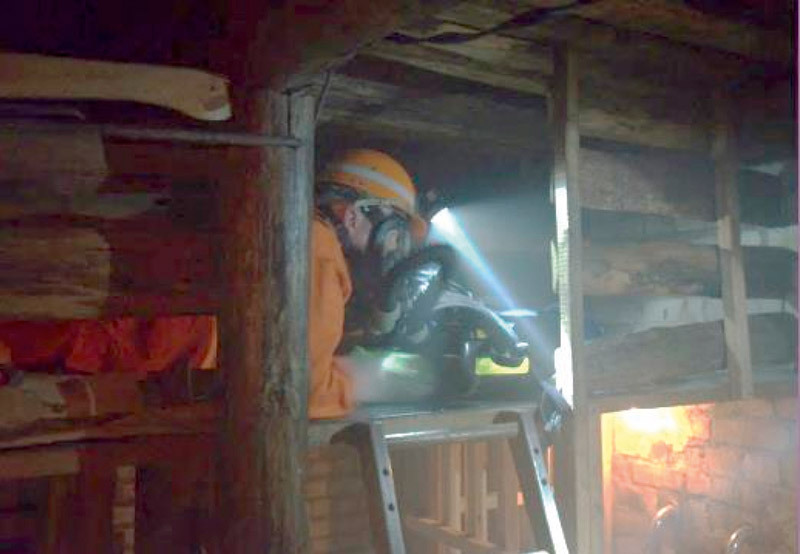 Participation in student mine rescue also benefits students from non-mining engineering majors by developing skills that lead to responsible performance under pressure, while emphasizing the importance of working as a team in the challenging environment of an underground mine rescue. Different legal and industry standards and boundary conditions in different mining regions may require specialized curricula for student mine rescue training courses. (2) United States Code of Federal Regulations 2014:Title 30, Part 49, Mine Rescue Teams. (3) Henderson, N. e. a.: Students Mine Rescue in Today’s Mining Engineering. Curriculum, Mining Engineering February 2014, Vol 66, No 2, pp 33 –37. (4) Mischo, H.; Weyer, J.: Reorganization of Mine Rescue Services Scheme in Central Europe. Preprint 14-064, SME Annual Meeting, Feb 23 – 26, 2014, Salt Lake City, UT, USA. (5) Mischo, H. (editor): Zukünftige Organisation des Grubenrettungswesens in Sachsen. 182 pages, Medienzentrum der Bergakademie Freiberg, 2013,ISBN 978-3-86012-465-9. (6) Hermülheim, W. e. a.: Handbuch für das Grubenrettungswesen im Steinkohlenbergbau. VGE Verlag, Essen, 2007,ISBN 9783-7739-1365-4. (7) Bezirksregierung Arnsberg: Bergverordnung für die Steinkohlenbergwerke (BVOSt). 10. Januar 2000, updated 1. June 2001. (8) EN-ISO 50303, 2000: Normen für den Explosionsschutz im Bergbau – Gruppe 1, Kategorie-M1-Geräte für den Einsatz in Atmosphären, die durch Grubengas und/oder brennbare Stäube gefährdet sind. Deutsche Fassung. (9) Westfälische Berggewerkschaftskasse Bochum: Grundriss der Bergtechnik. 3. Auflage, VGE Verlag, Essen, 1985,ISBN 9783-7739-0443-6. (10) Junghans, R.: Lehrbuch der Sicherheitstechnik. Band 1 Grubensicherheit Deutscher Verlag für Grundstoffindustrie VEB, 1969, ASIN B002PPZRMO.